Upgraded from our A-15 Model. A beautiful instrument well worth the price. 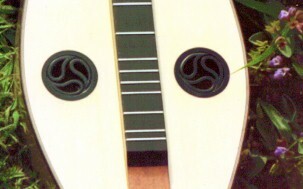 soundhole rosettes handcarved by Cyntia and manufactured fretboard inlays. inlays: many designs to choose from. mahogany, maple, walnut, rosewood, or Koa. exquisite purfling added for accent.